If you have not been to Venice add it to your wish list. 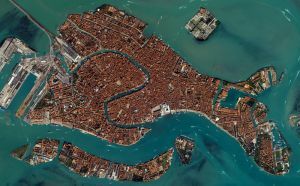 Venice goes back to antiquity and comprises of 118 small islands separated by, it is said 150 canals. The city in its entirety is listed as a World Heritage Site, along with its lagoon. It is the home for about 60,000 people. At the most it is 3 x 2 miles in size but don’t be fooled by the lack of hills. Every island is linked by a bridge high enough for all the small water craft to get under. That means quite a few steps. Once you have traversed maybe 50 over a day, you would have equalled climbing a small mountain. It is hard work. There are said to be 405 bridges in total. The Republic of Venice dominated the Adriatic in the Middle Ages right up to Napoleon, a rich trading state the forerunner of today’s Hong Kong and even Dubai. Bonaparte took Venice in 1797 but with his defeat it became associated with Austria, finally joining the new Kingdom of Italy in 1866. Regarded as one of the world’s most beautiful cities it averages 50,000 visitors a day with 2.5m in a year. There are plenty of flights into Marco Polo, the main airport, which is on the mainland about 10 miles to the railway station, the entry point to the city at the end of a causeway. If you are coming in by plane it is worthwhile trying for a window seat, the view is spectacular. Once through the terminal the best way in is by waterbus and many hotels offer this as part of their service. The alternative airport is Treviso, the home of Ryanair and an easy 20 miles by regular bus ride or taxi. Long distance European trains serve the Santa Lucia station but from there it is vaporetto (waterbus/taxi) regardless. Buy a pass. It is the only way around. Cars are not allowed into Venice completing their journey at Piazzale Roma by the railway station complex. The cruise ship terminal is close by but it is either a 15-minute walk, or a ride on the monorail which deposits passengers annoyingly away from the terminal. If you have cases take a taxi. Sitting out in the lagoon is the iconic Belmond Hotel Cipriani established in 1958 by Giuseppe Cipriani, founder of Harry’s Bar in Venice and inventor of the Bellini cocktail. Today it is the centre piece of the Belmond Group which also includes the Orient Express, a regular arrival at the Venice Station. Take the hotel’s own private taxi from the main waterbus terminal area by St Mark’s Square. Naturally it has a prime position. It is a free ride. The Porticciolo Pool Restaurant offers a fine buffet lunch on a hot day cooled by a breeze. If you decide to stay rooms are from £600. Venice is allied synonymously with music. La Fenice, built in 1786, is one of the most famous opera houses in the world, a wonderful building. After a disastrous fire in 1996, it was rebuilt and now has a full programme. The prices, even higher than Covent Garden, would indicate that the audience is helping towards the reconstruction. If you want to immerse yourself in the musical theme for a lot less I Musici Veneziani play the most beautiful popular arias of the Baroque period in the exclusive setting of Scuola Grande di San Teodoro. The lively musicians and singers perform in period costumes. Great value for €30. 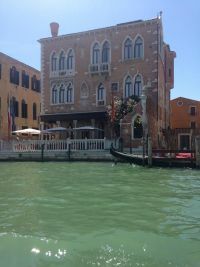 As part of your vaporetto package take a trip to the island of Murano renowned for its glass. Murano is home to the Museo Vetrario or Glass Museum in the Palazzo Giustinian, which holds displays on the history of glassmaking, as well as glass samples ranging from Egyptian times through the present day. Assembled by Napoleon, the Accademia Gallery of Venice is one of the world's greatest art treasure houses, and includes pieces by world-famous artists such as Bellini, Canaletto, Tintoretto, Titian and Leonardo da Vinci. This beautiful Palladio building with its central courtyard has been the subject of major refurbishment and following extensive restoration 30 new rooms were inaugurated in December 2013. The word Ghetto is now universal but in fact is Venetian and dates from the forced establishment of a Jewish commune in 1515. The Ghetto area is today lively with kosher restaurants, a museum and four active synagogues. Daily tours take place. Piazza San Marco (St Mark's Square) has always been the location of important government buildings and other facilities central to the goings on in Venice. The coffee shops are not cheap. 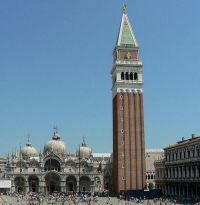 It is dominated by the magnificent St Mark's Basilica. Commissioned in 1071 by Doge Domenico Contarini, this amazing church is built in Venetian-Byzantine, a mixture of western and eastern styles. Nicknamed the "Church of Gold" because of its opulence, it has been the seat of the Patriarch of Venice, archbishop of the Roman Catholic Archdiocese of Venice, since 1807. Book your visit on-line. The basilica has a separate campanile – bell tower – that stands 98.6 meters tall (323 ft) and is one of the city's most recognizable landmarks. Originally built in the 9th century, the current version was rebuilt in 1912 after the original tower collapsed in 1902. The other dominant building around St Mark's Square is the Doge's Palace. A beautiful gothic structure, it faces the Venetian lagoon and was completed in the early 15th century, though portions of it were rebuilt after a fire in 1574. There is a selection of official tours. One includes a visit to the famous Bridge of Sighs connecting the Doge's Palace to the New Prisons. Built in 1614 its nickname refers to the convicts who, when crossing it, exhaled their last breath in freedom before serving their sentences in the prisons of Venice. Besides being filled with people and great specimens of architecture, Piazza San Marco is also full of pigeons. Pigeons have long been a problem in the square but only recently did the city pass a law that banned the feeding of these birds. The pigeons have caused much damage to the delicate mosaics on St Mark's Basilica and to other buildings around the piazza. Several attempts have been made to control the pigeon population but few have been even slightly successful.